Posted 7/12/2018 9:32am by Jill Rendleman. 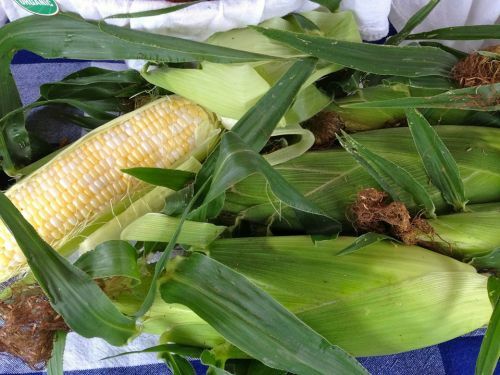 Sweet corn is in! Members will enjoy mixed sweet peppers, a new kind of tomato.....tomato berry!, cucumbers, and fresh basil. Let me know by TEXT 6183080217 if you have changes in pickup or any special requests!!! Posted 6/20/2018 7:03am by Jill Rendleman. 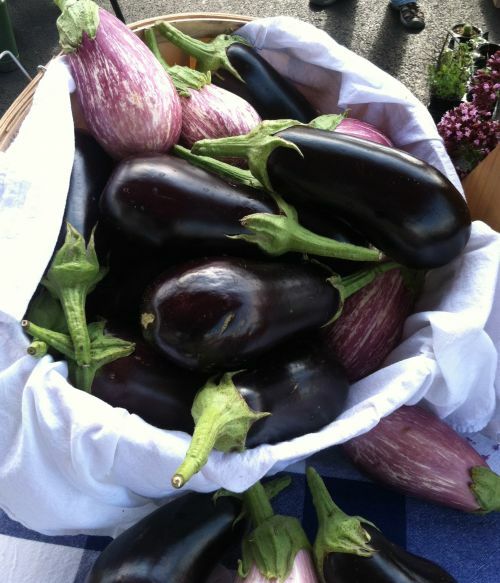 Members will enjoy new cucumbers, tomatoes, garlic scapes, and eggplant this week. 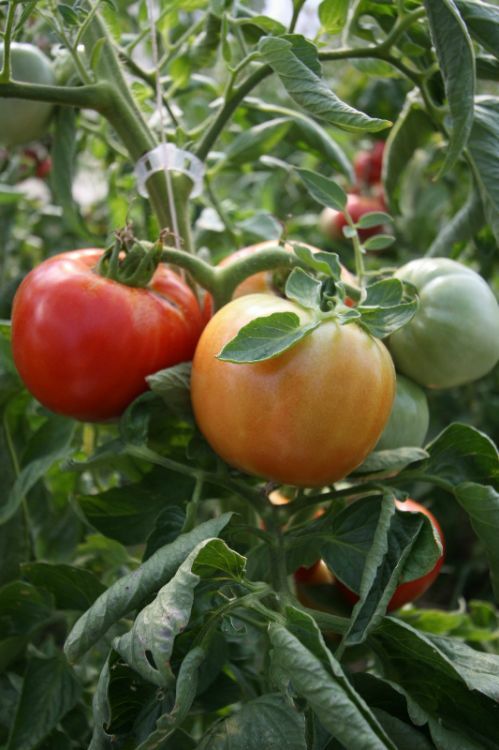 Let me know if you are due to for extras due to a vacation, we have a lot of cherry tomatoes and cucumbers! The cucs are the small or "no seed" European style and delicious! This is a great week for an eggplant parmesan or another fav dish. Sometimes we have one or two eggplant haters.....if so, let me know what to substitute! Posted 6/14/2018 6:41am by Jill Rendleman. Posted 6/6/2018 3:13pm by Jill Rendleman. Members can expect great things this week. More farm potatoes, chard (except kale for the chard haters), and best of all, a large dose of fresh basil. 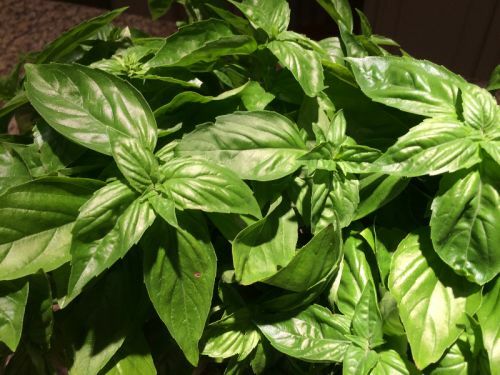 So what do you do with a lot of basil? easy and delicious....make pesto. Pesto is a meal in and of itself when tossed with noodles or atop bread. It is so very easy to make. Here's one from Alice Waters collection, if you dont know who she is, find out! One of the more interesting women of our time. Put basil in the blender with olive oil, and garlic. blend. add cheese and salt. blend. I make this in huge batches and put in jars with lids in fridge. Stays good for a few months. Add more or less basil or olive oil to your taste.....more oil means thinner pesto, less means more stout. Pinenuts are super expensive so I usually use pumpkin seeds. If you are going to store in fridge for a while, I would leave out the parmesan and add it in before you decide to eat it. 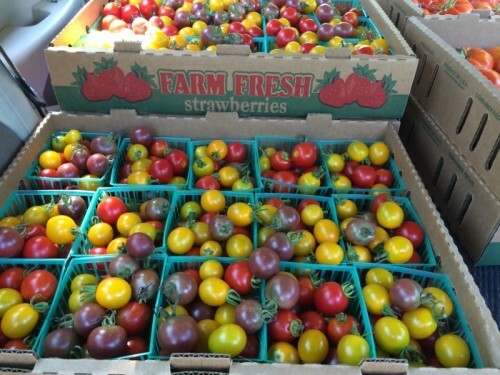 Today we are seeing a few cherry tomatoes changing colors, but not enough for the whole csa pick, but hopefully next week we will see the first tomatoes. 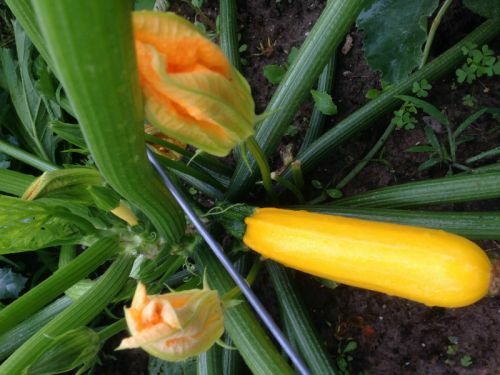 The zucchini is flowering as are the cucumbers. The peppers will be a while but they are looking nice. Green beans are still young but hopefully the rain and sun is good for them. It was a very short strawberry season, the rain and heat were not good for them. Blueberries I can see them, doesn't look like a huge crop, but a little rain and we should see some nice berries. This is the first year that I have had a space in time with no lettuces. There was a weather related planting gap that is leaving 2-3 weeks lettuce naked .....as I do feel that way. We do have more growing.....I know everyone is anxious for the summer veggies and we appreciate your patience with the most challenging of years! Posted 5/17/2018 2:05pm by Jill Rendleman. Strawberries are in! so sorry for the late notice, we had some heat and then rain issues and other things happening on the farm last two days. Look for fresh kale, strawberries, dill, awesome mushrooms this week for shares of mushrooms! Baby beets.....you MUST eat the greens. They are delicious cooked at last minute along side the beets. Beet haters you got an alternative in the box ...surprise! Posted 5/10/2018 6:48am by Jill Rendleman. 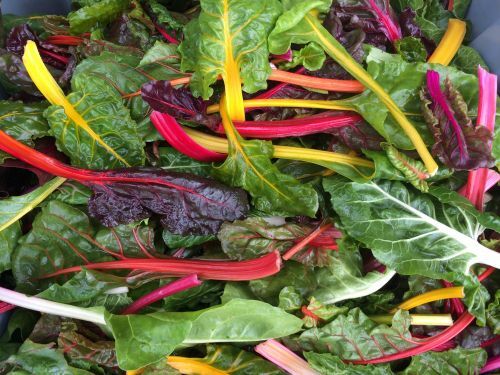 Chard is in, rainbow chard is beautiful braised on its on with olive oil, garlic, a little butter. Or....look for chard and lentil soup recipes....its the way I love chard best. Also look for more spinach, fresh mixed baby lettuce, and cilantro bunches for cilantro pesto! Sorry, no tomatoes yet to flavor the cilantro. Also, as a "treat" an introduction into a locally grown white rice that is non GMO. These producers came to the winter market and have a great product. You can try it today and let me know if you like it enough to want more. Remember to look for lots of chard and other recipes by veggie or fruit name at www.allseasons-farm.com, click on Recipes and look to the right to do a search. Posted 5/2/2018 8:37am by Jill Rendleman. Another member share pickup tomorrow. Thanks for bringing your boxes. They are quite expensive and we can use them several times. Look for more tatsoi and lettuces in your boxes this week. We also have some nice cilantro. Perhaps some beets or potatoes. Or maybe new chard! We finished planting tomatoes of all sorts. They were tall and leggy and so hard to plant! It was just too cold in the prior weeks to risk it! Now right on to summer plantings of corn, zucchini, beans, and peppers. Looks like the blueberries and strawberries made it through the freezing nights....but still keeping an eye on them. Posted 4/26/2018 7:00pm by Jill Rendleman. 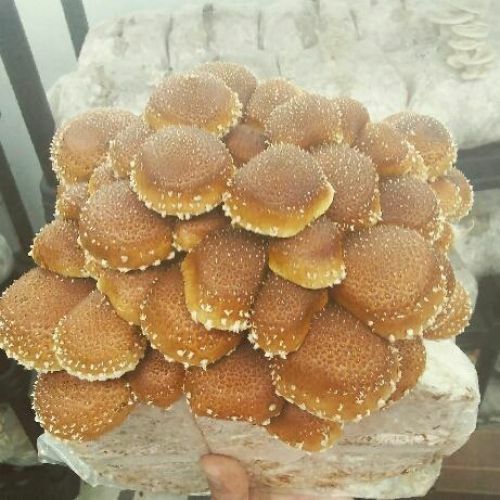 This weeks mushrooms for the "16 week" mushroom share are Shitake! yum. great just by themselves braised in half olive oil and half butter, but fabulous a top any other meat or veggie dish. We are so lucky to have Flyway Farm as a CSA partner. There are still about 5 mushroom shares still available.....for those who want to venture out.